Welcome to Day Two of the Creative Cuts & More Mega Recipe Blog Hop, I'm so glad you stopped back to see what I created today! If you came from Jennifer's Blog, you're in the right place, if not, after stopping here you might want to head back to the Die Cut Diva Blog so that you don't miss any of the wonderful creations. There are 24 designers sharing projects made with the new Holiday Treats Apron Recipe Kit from Creative Cuts & More. 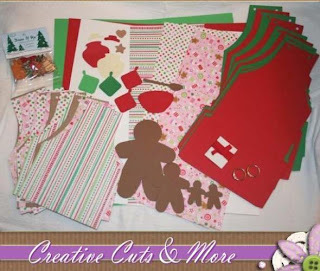 All the supplies you need to create your projects are included in the kit with the exception of Stamps, Tape, Recipes and other other miscellaneous items I noted in my details. I created an Apron Book using my Bind It All, binding the edge with a 3/4" Red Coil. Just a note, if you decide to bind your book, the thicker paper with the Glitter will not slide through your BIA if you have two Aprons back to back with the cardboard sandwiched between them. Punch one Apron with the Chipboard attached, punch the 2nd one, then adhere them together. I placed Jumbo Eyelets (setting them back to back) in the top of the apron and threaded the red ribbon (included in kit) through the front apron only. I added a bit of decorative edging by punching the Green card stock with Stampin' Up! 's Scallop Edge Punch. To personalize my Apron Book, I used the What's Cookin' Borders and Centers from JustRite, and the Small Letters Set, placing them on the 1-5/8" Wood Stamper, stamping them in Black on scraps of the Red and White card stock, using Spellbinders Circle Dies to cut them, then adhered to my pocked with dimensionals. The cute embellishments are part of the kit, I simply snapped off the button ring, then glued them in place with Glossy Accents. In the front pocked, I used some of the Die Cuts included in the kit and adhered them to my recipe card for Peanut Butter Creams. I've been making these since I was about 8 years old, my family just loves them! I made them the other day when I posted my sneak peek, and I kid you not they were gone in less than one day! On the inside pages, I added some more of the embellishments and die cuts. Again, I used the Scallop Edge Punch to add some trim to the apron. Another favorite treat my family loves is Oreo Mush. I used the Recipe Borders and Centers and the 1-3/16" Wood Stamper from JustRite to create my sentiment, stamping in Black on White card stock, then cutting with Spellbinders Circle Dies. I added a few Kaiser Gem, and glued on the Measuring Spoon Embellishment included in the kit. Here's a photo of the JustRite Images and Wood Stampers I used. (Not included in Kit). Other items used not included: Spellbinders Dies, CuttleBug, Jumbo Eyelets, Bind It All, BIA Coils, Ink, Adhesive, Kaiser Gems, Scallop Edge Punch. Don't forget, as part of the Mega Hop celebration, through November 14th, you can save 20% at Creative Cuts & More when you enter recipebloghop2009 during checkout. As a continuing part of the celebration, Creative Cuts & More will be giving away one of the new kits, to enter to win, simply return to the Die Cut Diva Blog and instead of leaving a comment, you'll need to share a recipe to have a chance at winning the kit. Share the recipe on your blog then link it back and get another chance to win the kit. Thanks for stopping by, I hope you enjoyed my project and recipes, next up on the Hop is Lila. Great idea to use the BIA for this!!! Love your decorated recipe cards!! This is FABULOUS Lisa. I didnt even think to make it an album. (smacking myself in the head) It just wasn't registering in my head. Yours turned out beautifully! WOW, another beautiful project! How clever and colorful, am luvin' what you did with this kit! YUM! The peanut butter creams sound delicious! Cute album! Fantastic work! I love the way you used the Bind It All and all the creative ways you embellished each recipe card! This is just darling and oh so creative! Love it! Wow, I love it all. The recipe book is awesome and so are the recipes. Love all the extra details with the BIA and the Just Rite Stamps. My son's favorite candy is Reese's Peanut Butter cups, I am definitely going to make your peanut butter creams. Thanks for sharing. Great idea to use the JR stampers! CUTE! Like your blog, so I hope it's ok that I've added it to my bloglist. Oreo Mush sounds interesting! Great project! Fabulous job Lisa, this is gorgeous! I love how you bound it together with the red Bind It All. And the Just Rite stamps are perfect. I love pockets for the recipe cards! Lovely job! Absolutely love the binding. I may need to put that on my wish list. oh do those loook yummy! i love the die-cuts on the recipe cards. Fabulous Aprons! Love how you did the binding. Great idea! Beautiful Work! AMAZING! Love that you bound it on the side! LOVE your work Lisa!! Simply Love it! and the awesome stamps! Hi Lisa! Love your adorable album! So cool to bind it on the side! My husband will love me even more if I make him these pb and oreo recipes! I made these and they were a big hit! Love this recipe. This is now my NEW thing!! Thank you!!! !